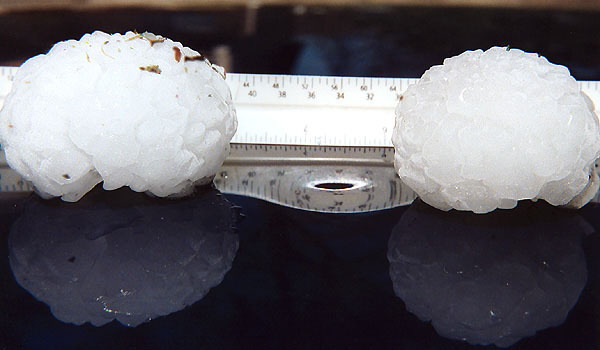 Photos by John Lindquist of some rather large hailstones that hit the Madison, Wisconsin area on the evening of April 13, 2006. Click on images to open them up in separate window. Here are photos of some souveneirs from what has become a legendary hailstorm in the Madison area. 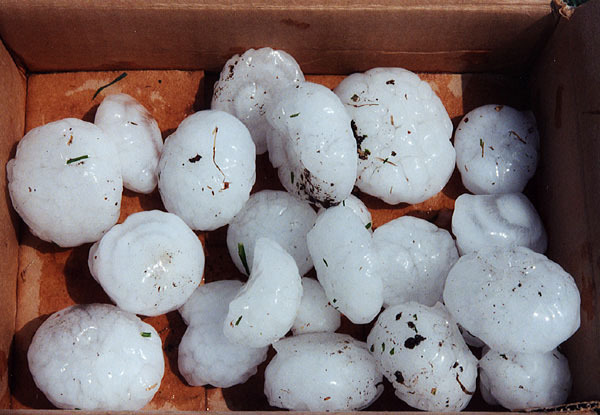 These shots were taken around noon the next day with a bunch of hailstones I had collected and stored in the freezer. 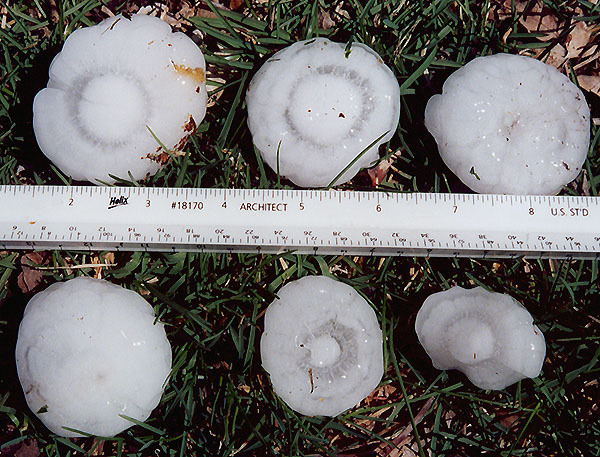 The first two photos are of the (arbitrarily-designated) "top" and "bottom" of a typical stone of the larger type, showing the uneven aggregation of smaller units from which  I am sure  a hailstone expert can deduce the story of its formation. In the middle row are two shots showing the "tops" and "bottoms" of six stones; inches are indicated on the top scale of the ruler. 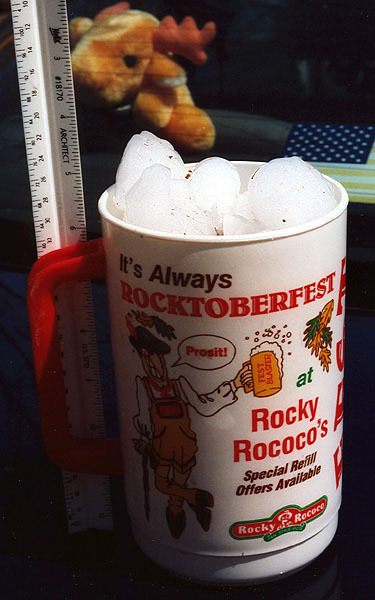 My trusty auto fared relatively well in the storm, receiving just a small dent on the roof (reflecting the ruler in the last photo) and another on the trunk lid. Bacteriological Relevance: Purple non-sulfur photosynthetic bacteria appear to have a major habitat in the bottom of shallow lakes and ponds where sunlight can penetrate and the bacteria can have the required anaerobic conditions in which to photosynthesize. Being metabolically versatile and not strictly anaerobic, they can also carry on respiration in the presence of oxygen. 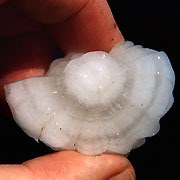 They can be carried about by water and wind currents and enter the atmosphere, coming down in rain and snow from which they can be easily cultured. 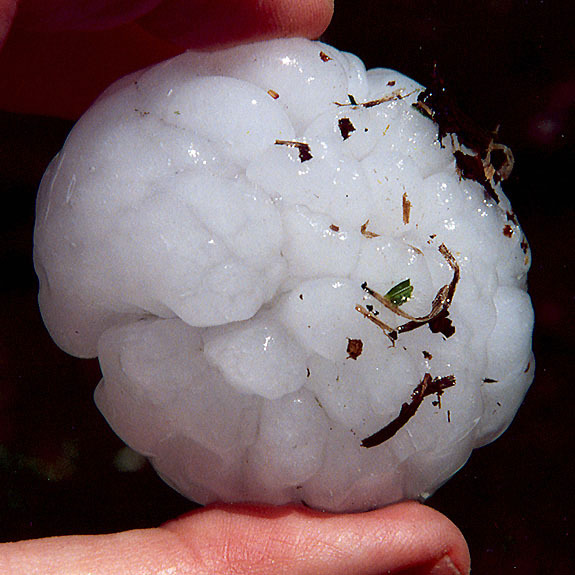 This has been one of my frequent observations (and undoubtedly something noted by other practicing bacteriologists), so why not see if they are a recoverable contaminant of hailstones? As an aside, they can even be found in the water trapped by pitcher plants and bromeliads! 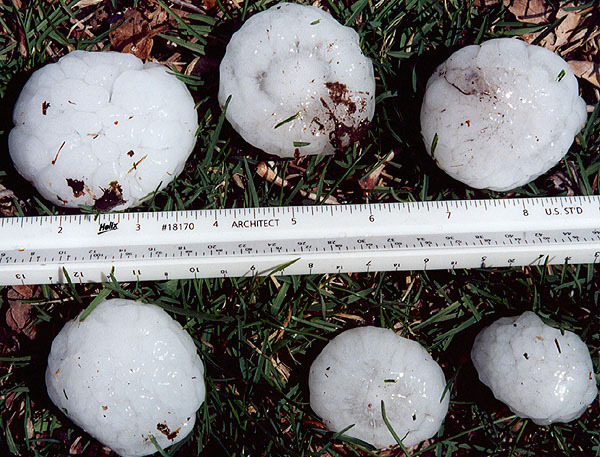 On April 25 I "sanitized" the exteriors of seven of the larger hailstones with hot sterile water – fresh from the autoclave – and set up some anaerobic enrichment cultures in the light as discussed here. (The addition of sterile mineral oil – seen floating on top of the medium as a yellowish layer – inhibits any further diffusion of oxygen into the medium which is made anaerobic by the respiratory activities of the bacteria.) 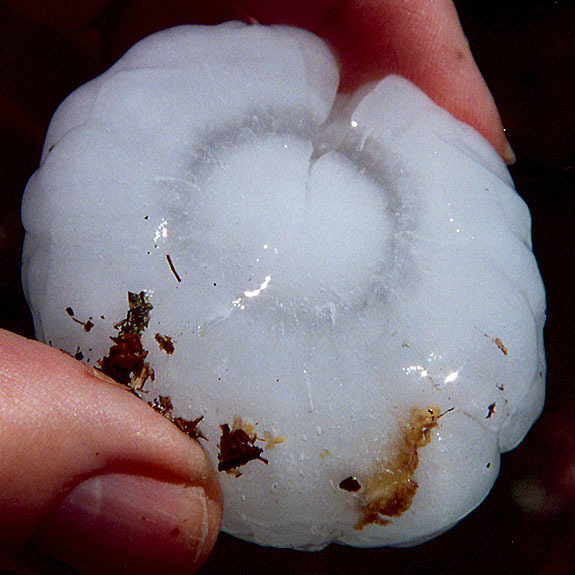 After eight days of incubation, the tell-tale bloom of these pigmented microorganisms finally began to show up in the enrichment for hailstone no. 03, followed in the next several days by 01 and 04. By May 14 all except 02 and 07 showed signs of typical growth of purple non-sulfur photosynthetic bacteria as shown below. Microscopically the dominant cell type in each of these five enrichments and among the colonies in the subsequent isolation plates resembled that of Rhodopseudomonas. Of course, this would not mean that Rhodopseudomonas would be the dominant purple non-sulfur bacterium in any of the hailstones, as enrichments always favor those organisms most amenable to such cultivation. on the megacryometeor phenomenon is here. Last modified on 6/1/06 at 3:00 PM, CDT. John Lindquist: home page, complete site outline.